Two pair of Giant Boxing Gloves are sure to wear out any kid or adult. Try swinging these giant boxing gloves at your friend and see who can hold out the longest. I assure you they will exhaust even the most in shape person. 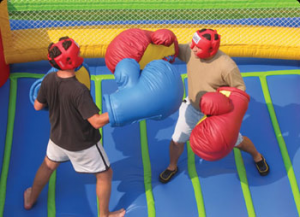 These Boxing Gloves can be added to any bounce house for additional fun at a Birthday Party or other event. There are even some good Fundraising ideas for this particular item. Can you imagine volunteers paying $2-4 a piece to be a part of this grand battle. Winner moves on the next round kind of situation. I’m sure you can come up with some creative ideas for the rules of the MAIN EVENT. ARENA is not included with this rental. This is for the Gloves Add-on only, must rent a bounce house of some sort and style to rent these giant boxing gloves. Check out our Online Reservation system that makes creating a booking super easy. No obligation to see pricing and get a printed quote. Make a deposit payment to hold the reservation. Check out FAQs for many common questions or call us for more specific information needs.